By now, you’be probably seen some of our London 2012 Olympics Twitter coverage. Today, we tracked the gold medal women’s soccer match between the United States and Japan. Just over a year ago, the US Women’s National Soccer Team lost to Japan in the 2011 FIFA Women’s World Cup, so this Olympic rematch promised to be very exciting. And it definitely delivered! With a record-setting 80,203 fans in the stadium, plus millions watching or listening around the world, the game was action-packed. USA scored the first goal of the game in the 8th minute of play, and the final score was 2-1, with the United States emerging victorious. 711,646 tweets were posted during the 2-hour soccer game from 433,797 different Twitter accounts. The most exciting moment during the game was at 19:55 UTC when Carli Lloyd scored the second US goal, which hit a peak of nearly 12K tweets per minute. At the end of the game, celebratory tweets about USA’s win skyrocketed up to around 22K tweets per minute. 261K tweets were posted about Team USA and 8K tweets were posted about Team Japan*. 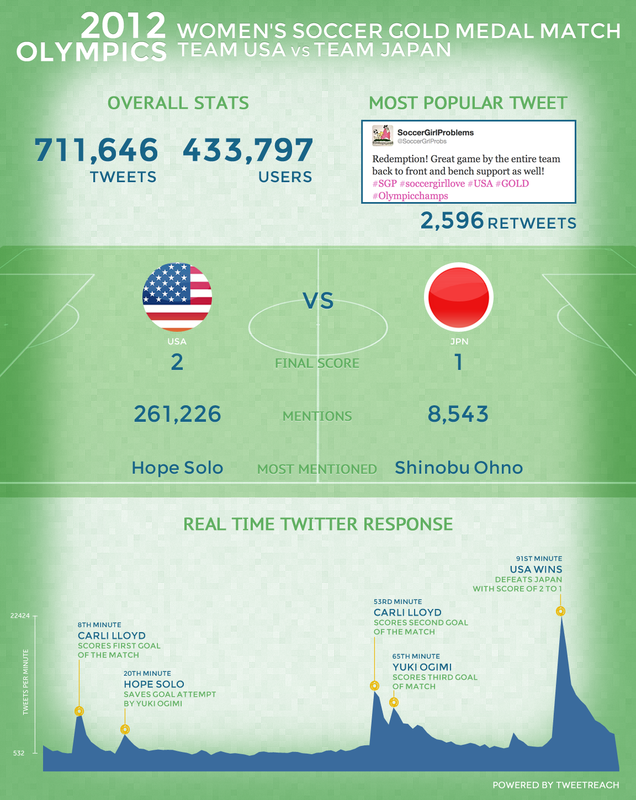 The most mentioned player on the US team was Hope Solo (with Carli Lloyd a close second) and the most mentioned player on the Japanese team was Shinobu Ohno. Click the image below for a full-sized version. Interested in doing your own analysis of Olympics tweets? We can help! Contact us to talk more. *It’s important to note that when the game was live in London (it started at 7:45 p.m. London time), it was very early in the morning in Japan and the middle of the day in the United States, so it’s likely that more US fans were watching than Japanese fans.